Read along as Sea Otter’s mother teaches him to find food and survive on his own. Danger lurks in the open sea when the otter pup has to learn how to cope with predators. 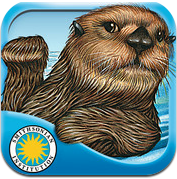 This app was reviewed by the Smithsonian Institution for accuracy and is part of a Summer Learning Series. The graphics are fantastic and the long standing support for early reading is evident. There is a fact section included to learn much more about these lovely creatures. Otter Pup’s First Day in The Water! Learn What Sea Otters Eat!